BusOnlineTicket.com gladly welcomes JetBus to join us and provide online booking service for their bus ticket. Through the partnership between BusOnlineTicket.com and JetBus, we aim to offer more options and routes for everyone to travel between KLIA and Kuala Lumpur. JetBus is one of the popular bus service providers in Malaysia under the management of Perkhidmatan Hafeena Sdn Bhd. The headquarter office of JetBus is located at Semenyih, Selangor. Buses deployed by JetBus are 40-seater buses with air-conditioner, spacious legroom, reclining seats and sufficient luggage space. Please note that the bus ticket price from KLIA to Kuala Lumpur Terminal Bersepadu Selatan (TBS) and from Kuala Lumpur Terminal Bersepadu Selatan (TBS) to KLIA is cost reasonably from RM 11.00 per way. Meanwhile, the bus ticket price between Putra Heights and KLIA or KLIA2 is priced affordably at RM 4.00 per way. 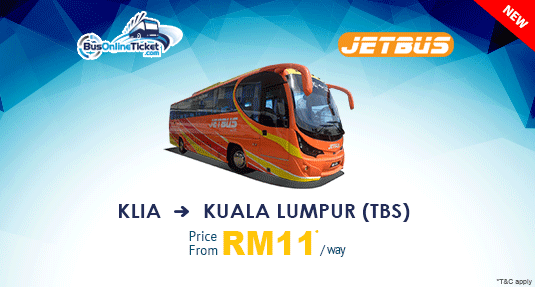 Booking JetBus bus tickets via BusOnlineTicket.com is easy-peasy. You only need to choose your trip, departure date and we will provide you with the list of available trips for booking. Instant email confirmation will be sent to you once the payment is received.